At a meeting with the directors of the European Bank for Reconstruction and Development, Bankwatch campaigners read a statement from Italian communities opposing the Trans-Adriatic Pipeline, the last leg of the Southern Gas Corridor, a 3500 km pipeline intended to bring gas from Azerbaijan to Europe. We, in the Salento region, live off agriculture, fishing and tourism, and we are oriented towards a system of environmental sustainability. Salento is a wonderful land, that has already suffered too much damages due to industrial developments, and where tumor cancer incidence is high. The town of Melendugno and the surroundings are an oasis of happiness thanks to the historical attention to the protection of the environment. But now they imposed the Trans Adriatic Pipeline on our land, a large infrastructure which has nothing to do with our way of life. Despite what the government says, there have been no public consultations. In fact, we, as citizens, have been kept in the dark about everything around the TAP project. But we have managed to get the information on our own. Over the years, we studied the entire project and, based on what we have seen and read, this project is useless and anachronistic, anywhere it is implemented. We have repeatedly voiced our concerns and our objections to the project, but the company and the government decided to ignore it. They chose to side by the TAP consortium. In late March, in order to allow the works at the site to begin, the government deployed battalions of police and security forces. They were tasked with defending the uprooting of our olive trees, even though the company did not have all the necessary permits. As local residents we peacefully resisted the works, but the police did not hesitate to attack common citizens, teenagers, elderly people, and even mayors and members of the European Parliament. Ours is a movement of people, of mothers and families, determined to oppose this project and protect our livelihoods. But we believe in non-violence, and our protests are peaceful. The violence we had faced from our own state has not scared us. Rather, it united us even more and emboldened our position. And we know we are not alone in this struggle. Communities in Greece and Albania, who have also been sidelined by the massive political and commercial interests that the TAP project represents, continue to oppose it. And together we call on you to not to finance this project. If the EBRD stands for democracy it should not support TAP. 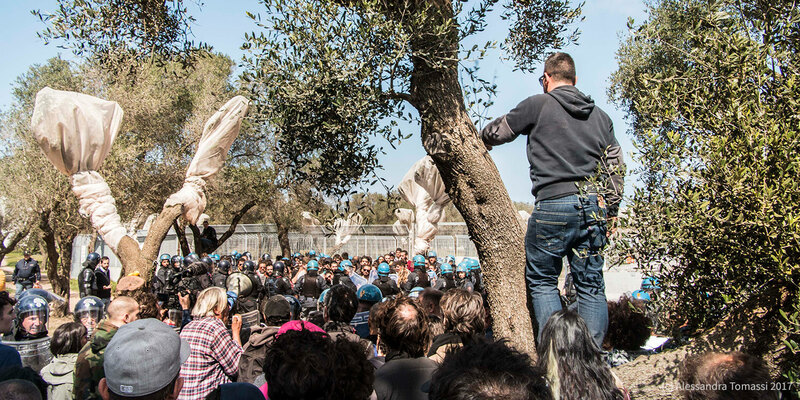 These olive branches could be the last ones that our centuries-old trees will ever grow, but they symbolize our peaceful resistance to this project.